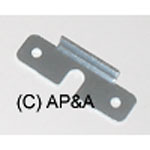 Metal pop bumper coil linkage yoke. Modern Stern Pinball part but standard size, so it fits most makes and models. Nice reinforced part- has 90-degree bend on one edge to resist cracking & breaking and last longer than the weaker Bally/Williams #01-5492 part from previous years. Direct replacement for Bally # P-3656-5, Bally/Williams # 01-5492, Stern # 535-7346-00, and Data East/Sega #s 535-5072-00 & 535-5877-00. Also replaces Gottlieb # A-12149, old Stern # A1-124, and more. Original yokes are commonly worn out or broken on most older and well-used games. Replace to restore proper pop bumper action!